Ganesha Chaturthi is one of the popular festival of hindu religion, it is celebrated as the birth anniversary of Lord Ganesh. Ganesh Chaturthi is a famous Hindu festival celebrated in the honor of God Ganesha. This spectacular festival honors the birth of the beloved Hindu God, the elephant-headed Ganesha. It is celebrated in late August or early September. It falls on the fourth day after new moon in the Hindu month Bhadrapada. It is mainly celebrated in the states of Maharashtra, Goa, Karnataka, Andhra Pradesh and Tamil Nadu. It is also known as Vinayak Chaturthi. It lasts for 10 days in the state of Maharashtra, ending on the day of Ananta Chaturdashi. It is not clearly known when and how Ganesh Chaturthi was first celebrated but as a public event, it is celebrated in Pune since the times of Shivaji, the founder of Maratha empire. In 1893, Lokmanya Bal Gangadhar Tilak transformed this annual domestic festival into a large, well organized public event. Tilak recognized the wide appeal of Lord Ganesha and popularized Ganesh Chaturthi as a national festival in order to bridge the gap between Brahmins and Non-Brahmins and build unity between them. Ganesh Chaturthi is celebrated in India (specially Maharashtra) with great joy and enthusiasm. On the day of the festival, a life-like clay model of lard Ganesha is placed on raised platform in homes or public places. The size of the idol may vary from an inch small to over 25 feet long. The red silk dhoti wore priests invoke life into the idol amidst the chanting the mantras. The Ganesh Chaturthi celebration generated nationalistic fervor among people in Maharashtra against the British rule that was an additional benefit. Individuals and employees of private companies can take a limited number of restricted holidays but government officers and most businesses remain open. It is one of the India's vast religious and cultural society celebrations so all the schools and colleges are closed on this day in Maharashtra. When is Ganesha Chaturthi in 2010? When is Ganesha Chaturthi in 2011? When is Ganesha Chaturthi in 2012? 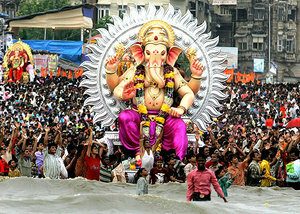 When is Ganesha Chaturthi in 2013? When is Ganesha Chaturthi in 2014? When is Ganesha Chaturthi in 2015? When is Ganesha Chaturthi in 2016? When is Ganesha Chaturthi in 2017? When is Ganesha Chaturthi in 2018? When is Ganesha Chaturthi in 2019? When is Ganesha Chaturthi in 2020? When is Ganesha Chaturthi in 2021? When is Ganesha Chaturthi in 2022? When is Ganesha Chaturthi in 2023? When is Ganesha Chaturthi in 2024? When is Ganesha Chaturthi in 2025? When is Ganesha Chaturthi in 2026? When is Ganesha Chaturthi in 2027? When is Ganesha Chaturthi in 2028? When is Ganesha Chaturthi in 2029? When is Ganesha Chaturthi in 2030?